Winnebago Touring Coach is a division of Winnebago Industries located in Forest City, Iowa. The Touring Coach Division features Class B motor homes, The Van Life Movement - the Winnebago Era, the Winnebago Travato, the Winnebago Revel, and the newest entry, the Winnebago Boldt. Winnebago Touring Coach joins the Winnebago line to form the complete motor home product line from Winnebago Industries. 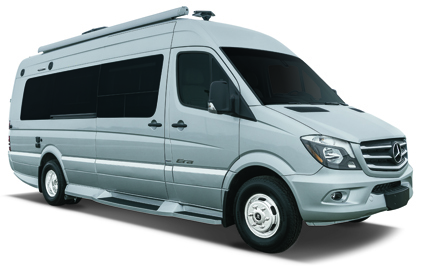 The successful Era is built on the Mercedes-Benz Sprinter Chassis boasting 20-22 MPG. 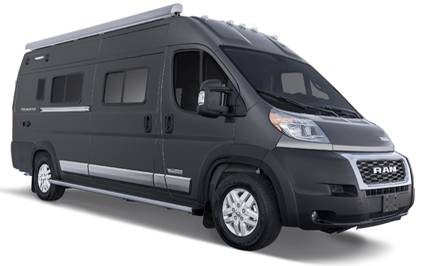 The Travato is built on the Ram ProMaster Chassis boasting 18-22 MPG. 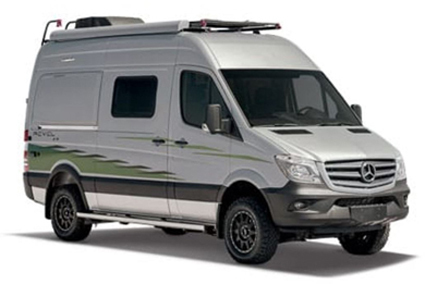 The Revel is Winnebago's first true 4x4 built on the Mercedes-Benz Sprinter Chassis. And finally the Winnebago Boldt, the first fuel-efficient, Mercedes-Benz VS30 Van partnering with the Pure3 Volta Power Systems Lithium Energy System. One of the first motorhomes in its class built on the Mercedes- Benz® Sprinter® chassis, the Winnebago® Era® launched a whole new “era” of upscale touring. Now, with an available 4WD option and other enhancements, the Era continues to raise the bar. The four Era floorplans offer a variety of seating, sleeping, bathing, and cooking options, accented by premium contemporary interior styling, sumptuous Ultraleather™ furnishings, and dimmable LED lighting. Full galleys feature stainless steel appliances and a compressor-powered refrigerator for optimal cooling performance. Outside, a powered patio awning, LED lighting, and exterior speakers make it easy to relax, while the expandable solar power system helps keep the power flowing, even when you’re off the grid. Tour in style and camp in luxury: see the world in your Winnebago Era. 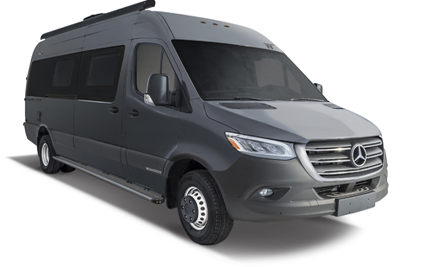 The Winnebago® Boldt™ is a first-of-its-kind Class B coach built on the world-renowned Mercedes-Benz VS30 Sprinter Van chassis. Winnebago now leads in innovation with the Winnebago Boldt, the first fuel-efficient Van partnering with the Pure 3 Volta Power Systems Lithium energy system, providing users a generator-free #VanLife experience. Inspired by German explorer and naturalist Alexander Von Humboldt, the Boldt was built for adventure. The Winnebago Boldt is available in two floorplans – the 70BL and 70KL. Based on the powerful, fuel-efficient Ram ProMaster® chassis, the Travato® has been at the forefront of the B-van revolution since its launch. Thanks to premium features such as Corian® countertops, energy-saving Truma Combi™ eco plus heating, and the Deluxe FROLI® sleeping system, the new Travato is better than ever. With significantly upgraded standard features like 200-watt solar panels and new interior décor colorways, alongside several options, you can tailor the Travato to suit your needs. And now, Winnebago Industries® is introducing the most powerful advanced energy system in its class. The compact and easy-to-use Pure3 Energy Management System comes standard in the 2019 Travato® 59GL and 59KL. Pure3is built with advanced engineering and a simple user interface so you can have confidence and peace of mind as you travel down the road. Designed specifically for active outdoor enthusiasts, the all new Winnebago Revel takes a no nonsense approach to adventure with a straightforward design and function-driven features. Taking full advantage of the proven 4x4 Mercedes Benz Sprinter chassis, the Revel’s 3.0 litre turbo diesel puts 325 lbs ft of torque through an on-demand 4WD system, complete with high and low range and hill descent mode for added off road capability.